Update 3:55 p.m. with concerns from a council member. Around $12 million in new spending is being added to the city of San Diego’s nearly $3 billion budget proposal for the upcoming fiscal year, Mayor Kevin Faulconer announced Tuesday. The “May Revise” was brought about by a $7.2 million increase in projected property tax revenue in the fiscal year that begins July 1, and an extra $1.4 million in income expected from hotel room taxes, plus some other new money, according to the mayor’s office. The proposed revisions address a top priority for several City Council members – funding for a program manager who would be in charge of a climate change action plan, which is expected to be approved sometime in the next several months. 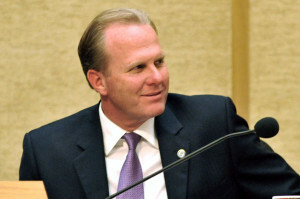 Faulconer has proposed spending $200,000 to hire a sustainability program manager, who would oversee the climate change program and other conservation causes being championed by council members, such as a proposal to drastically reduce the use of plastic shopping bags. Other new expenditures proposed by the mayor include streetlight installation, parks projects, extra support for the San Diego police helicopter, equipment for the fire department and transit plans for Encanto and City Heights. Councilman David Alvarez expressed disappointment that, in his view, the neighborhoods he represents are not receiving their fair share of project funding. Alvarez, who lost to Faulconer in the mayoral runoff election three months ago, said he looks forward to working with his City Council colleagues and the mayor to get the project built. The budget revision also includes some shifting of funds to create a department that focuses on performance and analytics, consolidating the currently decentralized communications staff, and strengthening a fund that pays out legal settlements. The original spending plan released last month already increases the hours that libraries are open, hikes the amount of officers in police academies, boosts the number of fire academies and provides extra money for infrastructure projects. The mayor’s office is scheduled to formally present the proposed changes at a special City Council meeting scheduled for Wednesday morning. The council is scheduled to approve the budget budget next month.